Shadow planets Rahu and Ketu are ever retrograde in their motion. Forever chasing Sun and Moon in order that they might avenge their beheading by Sun and Moon after the Churning of the Ocean. With such action, they cause the eclipse of Sun and Moon. Where eclipses happen, the nakshatra is spoiled for the next six months. As shadow planets, they move through the birth chart signs with retrograde motion and every 18 months, change signs (peyarchi). The important Rahu-Ketu axis – has significance for nations and their leadership in particular – changes signs. All is change in the body of time and space. 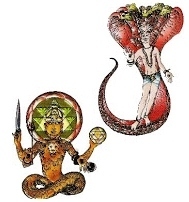 The Shadow Planets Rahu and Ketu also elicit, by their transit and retrograde motion, changes within the human person. Rahu and Ketu affect all with their transits. During July of 2017, Rahu will move to Cancer; Ketu will move to Capricorn.